The Victorian posy is enjoying a bit of resurgence. This delicate design first became very popular with brides and their bridesmaids back in the mid 19th century but then slipped out of favouritism in the late 20th century to be replaced with the still very popular shower bouquet.But like everything else in floristry the Victorian posy has gone full circle and has now become very popular with weddings all year round – although it has been modernised! In the last century the Victorian posy used to be backed with starched lace of even a plastic frill. Thankfully we have moved on and gloriously coloured netting raffia and twisted wire and lush foliage have now replaced them. Naturally a traditional look can still be achieved by using your so-called traditional flowers – obviously the rose, but also hyacinths and country flowers such as cornflowers. The Victorians used pale pinks, blues, lilacs because they simply didn’t have the wide range of flowers and colours which are available now. These days you can virtually create a Victorian posy out of any sturdy flower and foliage but to keep it a true Victorian posy you must always have that central stunning rose. The Victorian posy is both very neat and very fussy. It is basically made up of concentric circles of plant material. The circles were meant to represent everlasting love which is why it was so popular at weddings. It is always domed so that whatever angle you look at it from, it is perfectly equal and has interest. 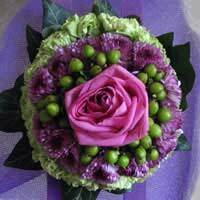 It can be either wired or done as a natural hand-tied with the stems showing. Naturally wiring is very time consuming but it does give you the flexibility to move your design into shape and have more control over what you are doing. One large rose; four stems of hypericum berries; 15 small headed chrysanthemums; 15 open carnations; ivy; coloured net; complementary ribbon; wires; tape; binding wire. Lay out all your materials and cut flowers to size. Wire and tape as necessary. Cover the handle with ribbon and add the bow. Hi, carrying out a little research, on Posies, due to the book I am writing concerning a Victorian Gent of the 1800's. Yes he had access to large gardens, (his own and neighbors), and would enter shows with which he would mostly win prizes! I know very little on the subject, hence the inquiry. He made miniature posies I believe. Regards.